So Valentine's Day is a week away for all you lucky ladies that have a boyfriend, (I'm not jealous or anything...), I've planned an outfit that's geek chic! How cute is this Topshop dress, perfect for any Valentine's date, whether it be dinner or cinema! It's on sale so be quick before it sells out! These Mary Jane shoes remind me of primary school, believe me they are on trend, I'm not just trying to re-live my childhood. They also come in a zingy orange if you like your shoes to make a statement. This is just cute piece that would just take the look one step further and it's only £6! Everyone is wearing frilly socks, whether it be with Mary Jane's like I have styled or with boots and heels, perfect accessory that keeps your outfit on trend but also fun. What will you be wearing on Valentine's Day? i love the bracelet, I think it's really cute. Despite having a bf we don't do anything for valentines, the past 2 years I got him some beer and chocolate and he forgot and had to go to morrisons to get me flowers and chocolate. This year we aren't even bothering lol. 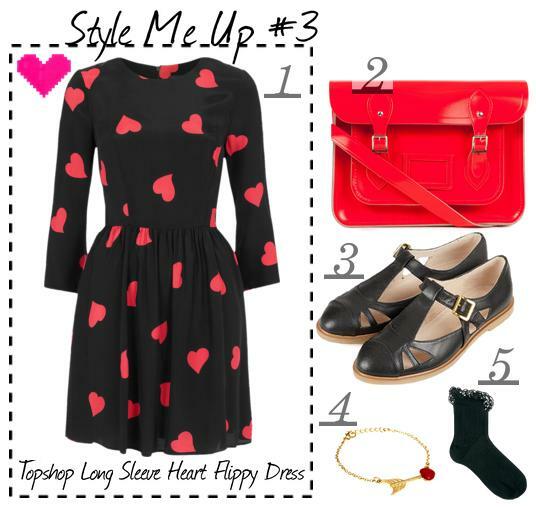 That heart print dress is adorable, I love that is has sleeves as well. There aren't enough dresses out there with sleeves. I love that dress!! It's so cute, and perfect for Valentines! In love with the shoes and I want a Cambridge satchel in Pink! Everybody is getting so creative with their nails these days, it's fantastic. I have a friend that can do some amazing designs on both hands...ON BOTH HANDS. I struggle to do a simple coat of paint on my left hand let alone little decorations and what not. This is the first time i have come across your blog and it's really great. I am new to the blogosphere so it's good to see so much talent out there. Have an amazing Valentines Day and feel free to check out my blog too, it'd be fun to chat.